Home Sport En Garde, Ready, Fence! What is fencing and why is it so great? Siobhan Regan gives us a quick run-down about the sport and why it’s so much more than just poking at each other with pointy sticks. Fencing is one of the oldest Olympic sports in history. It has been likened to ‘physical chess’ due to the vast amounts of mental as well as physical stimulation that is involved. Fencers need to train hard, and often, to build up the strength and ability needed for intense matches. And to top it all off, we wear white straightjackets and Daft Punk helmets and somehow manage to make it work. I’m here to tell you a little more about the sport and why here at Lancaster, we’re well worth watching. For starters, there are three main weapons in fencing – Foil, Epee and Sabre. Foil is the most traditional of the three, with the target area being the torso. In Epee, however, the target is the whole body, so it’s the most similar to real duelling. Foil and Epee are point weapons (meaning you need to stab people with the end of the blade) but with Sabre, you can slash them anywhere on the upper body and score a point. All three weapons are different, and everyone has a favourite but all of them involve the central skills of speed, accuracy and precision. The great thing about fencing is that it doesn’t matter how big or strong you are. Fencers come in all different shapes and sizes and from all matter of backgrounds. 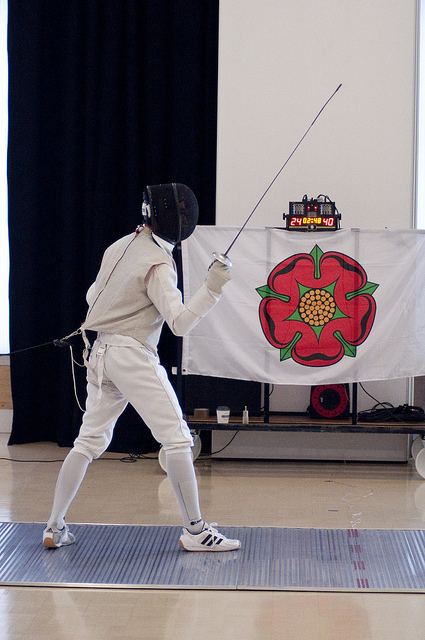 In fact, the majority of the fencers in our club didn’t even fence before coming to University. Despite this, last year we were one of the University’s most successful sports club and this year, our numbers have just kept growing. We now have two men’s teams, captained by Luke Rees (Men’s As) and Owen Birch (Men’s Bs). Both teams are steadily strong in their respective leagues, despite facing some daunting adversaries. Our women’s team (captained by Katie Work) is currently undefeated in this year’s league; including winning our toughest match against York, putting us in high spirits for Roses. The women are also moving into the semi-finals of the BUCS Cup and have a good chance of taking it all the way! Our fencing teams typically have three fencers per weapon with a few subs for tactical switches or to give some newer fencers valuable match experience. Each weapon is fenced to 45 points, with the hope of winning all three weapons and scoring a golden 135 points overall. Matches typically last around two hours, but are always jam-packed with shouts of support and an abundance of snacks. Speaking as a member of the women’s team, our cheering/snack-consumption combo (along with the odd massage) has been a fundamental part of our success and spectators are always welcome. Our coaching legends Mike Thornton and Kian Ryan like to put us through our paces at training (Kian’s ‘light’ warm-ups are arguably not too dissimilar from medieval torture!) but we always have fun along the way. Societies that sweat together, stay together and we often play games to keep the endorphins flowing. Fencing is a great stress relief when life is getting on top of you and sometimes running around with a sword is the best way to work through that. Our society is always looking for new members, so if you think fencing might sound like something you’d be interested in, we run regular training sessions on Tuesdays, Thursdays and Sundays. Alternatively, we have a Just Play session every Saturday morning 11am-1pm especially for those who want to try something new. So if stabbing people (legally) with a sword whilst making new friends sounds good, come down the Sports Centre and give fencing a try.